Anthropogenic environmental pollution reduces the effectiveness of the nervous, immune and endocrine systems. This leads to an increase in chromosomal abnormalities and disrupts the cytogenetic stability of the body. The work has been prompted by the need to identify cytogenetic features of bioindicators reflecting the quality of the habitat. Bioindicators live together with people under the same pollution conditions. They are an important link between human and ecosystem health (Hayes et al., 2002). The micronucleus test has been recognized as one of the most successful and reliable assays for genotoxic carcinogens. Micronuclei are formed in the cells of proliferating tissues of the body (Zhuleva & Dubinin, 1994; Hayashi et al., 2000). Micronuclei primarily result from acentric chromosome fragments or lagging whole chromosomes that are not included in the daughter nuclei produced by mitosis because they fail to correctly attach to the spindle during the segregation of chromosomes in the anaphase. The bone marrow of amphibians is an important organ of the hematopoietic system. The proportion of immature erythrocytes in the bone marrow exceeds the other parts of the hematopoietic system (Akulenko, 2008). Comparative counting of chromosomal abnormalities in polychromatic erythrocytes (PCE) bone marrow cells and normochromatophylic erythrocytes (NCE) of peripheral blood is topical due to high erythropoietic activity of the bone marrow. The work seeks to determine the frequency of polychromatic erythrocytes with micronuclei in the bone marrow and normochromatophylic erythrocytes with micronuclei in the blood of Pelophylax ridibundus living in transformed ecosystems of the Nizhniy Novgorod region. • the peat bog Sitnikovsky ornithological reserve (hereinafter – the peat bog) (the Bor district; 56.439791, 44.072462). In water, total content of iron, manganese, copper, chromium, nitrate (NO3), nitrite (NO2), lead, nickel, zinc, chlorides, sulfates, sulfides, and petroleum products was determined using spectrophotometry. The calculation of the specific combinatory water pollution index was made according to the UKIZV standard (Smirnova et al., 2011). The work was carried out in accordance with the International Guiding Principles for Biomedical Research Involving Animals (CIOMS, Geneva, 1985, 2012). Pelophylax ridibundus were immobilized, and blood and bone marrow smears were prepared (Zhuleva & Dubinin, 1994; Hematology, 2004). The differentiation of micronuclei was carried out using the Meiji Techno microscope with immersion, at 1500x magnification, with objects measured. Calculation of the area of micronuclei (μm2) was carried out according to the ellipse formula: S = πab, where a – is the semi-major axis of the ellipse, b – is the semi-minor axis of the ellipse, π = 3.14. For statistical analysis, we calculated the Kruskal – Wallis criteria (H); the Dunn's test (D); the Wilcoxon test (W); the z criterion when comparing the proportions. The analysis was carried out using Statistica V.8.0. and R-studio programs. The P-value was accepted to be 0.05. The hydrochemical analysis revealed that the content of chemical compounds in the water has been exceeded. In all the water bodies the maximum permissible concentrations of iron, manganese, copper, chromium, sulfides and petroleum products were registered. The water in the Berezovsky lake and the peat bog corresponded to Class 4, very dirty, and the waters of the river Kudma to Class 5, extremely dirty. The micronuclei are detected at different stages of erythrocyte maturing. The attached micronucleus (77.8%) is most common in the erythrocytes bloodstream (NCE). The disintegrated micronucleus (19.13%), the rounded micronucleus (2.42%) and the rod-shaped micronucleus (0.53%) showed a low proportion. The shares of rounded (36.6%), disintegrated (30.9%) and attached (29.5%), micronuclei were comparable in the immature bone marrow cells (PCE). The rod-shaped micronuclei (2.6%) were rarely encountered. 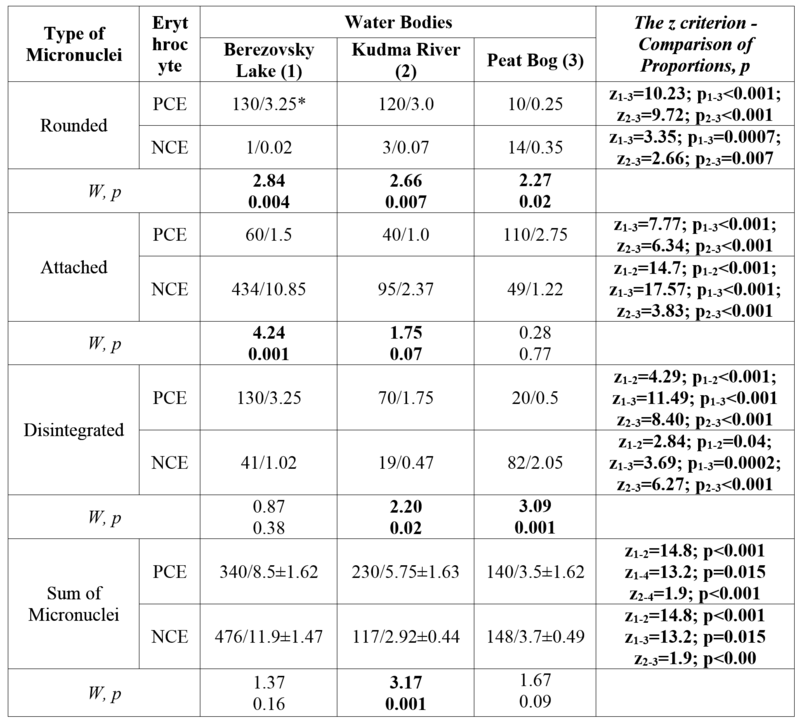 The chromosomal abnormalities in polychromatic cells of the bone marrow and normochromatophylic blood erythrocytes of Pelophylax ridibundus in the Berezovsky lake showed that the proportion of the rounded micronuclei (W = 2.84, p = 0.004) and the attached micronuclei (W = 4.24, p <0.001) in the NCE was less than that in the PCE. A low proportion of rounded micronuclei (W = 2.66, p = 0.007), disintegrated micronuclei (W = 2.75, p = 0.007), and a high proportion of attached micronuclei (W = 1.75, p = 0.07) in the NCE were obtained for frogs inhabiting the Kudma river. Also, in this sample, the total amount of micronuclei in the cells of the NCE (230 / 5.75 ± 1.63) is statistically significantly higher than the sum of micronuclei in the PCE (117 / 2.92 ± 0.44) (W = 3.17, p = 0.001). On the contrary, an increase in the proportion of the formed micronuclei (W = 2.27, p = 0.02) and disintegrated ones (W = 3.09, p = 0.5001) in the NHE as compared with the PCE was observed in Pelophylax ridibundus in the peat bog (Table 1). The induction of micronuclei in the proliferating tissue of frogs can occur both by direct action of pollutants contained in the aquatic environment, and indirectly through the reduction of the adaptive response of the organism and the violation of DNA repair processes. The area of disintegrated micronuclei was 3-4 times larger than the area of attached micronuclei in the PCE and NCE erythrocytes. The areas of the rounded and rod-shaped ones could be compared (Table 2). Thus, the micronuclei in young cells of the bone marrow retained their size in the mature forms of erythrocytes. It is known that the acentric fragments of chromosomes are the most unstable type of aberrations. They are eliminated after the first cell division in 70% of the cases (Sushko et al., 2005). It can be assumed that the elimination of the damaged DNA or a change in the micronuclei morphology occurs in bone marrow cells with clastogenic (rounded, disintegrated) micronuclei due to a high rate of the bone marrow renewal. This assumption is confirmed by the redistribution of the ratio of micronuclei species in erythrocytes with different degrees of maturation. The results obtained broaden our understanding of the morphological features of micronuclei and reasons for their formation. Immature erythrocytes with micronuclei of the rounded type are predominantly found in bone marrow cells with a high rate of renewal. The merging and transformation of micronuclei occurs in the process of mitotic division and erythrocytes maturing. It leads to a prepotency in the bloodstream of erythrocytes with disintegrated micronuclei and an attached micronucleus. Disorders of cytogenetic homeostasis of Pelophylax ridibundus (induction of micronuclei in erythrocytes) occur under the conditions of an increased content of chemical elements in water and indicate the transformation of natural communities. In this way, an integrated research study of the environment using the cytogenetic characteristics of living organisms is called for. Hematology. The newest directory / Ed. K. M. Abdulkadyrova. SPb: The Owl Publishing House, 2004. 928 p.
Zhuleva L.Yu., Dubinin N.P The use of micronuclear test to assess the environmental situation in the Astrakhan region // Genetics. 1994. V. 30 №. 7. P. 999–1004. Smirnova V.M., Makeev I.S., Blagodatkin A.V. Method of integrated assessment of surface water contamination by hydrochemical indicators. Determination of the specific combinatory index of water pollution (UKIP) and the water quality class // Nizhniy Novgorod. 2011. 19 p.
Sushko S.N., Malenchenko A.F., Ferapontova N.A. Genetic damages in blood cells under combined radiation-toxic action. The role of dose rate // Problems of health and ecology. 2005. № 2 (4). P. 20–27. Hayashi M.L., MacGregor J.T, Gatehouse D.G., Adler I.D. et al. In vivo rodent erythrocyte micronucleus assay // Environ Mol Mutagen. 2000. Vol. 35 (3). P. 234–252. Hayes T.B., Collins A., Lee M., Mendoza M., Noriega N., Stuart A.A., Vonk A, Hermaphroditic, demasculinized frogs after exposure to the herbicide atrazine at low ecologically relevant doses. – PNAS. 2002. Vol. 99(8). P. 5476–5480.